"The Best Fresco Pigments are the Natural Earth and Mineral Pigments. View the base list of pigments for fresco painting with their corresponding descriptions and use in fresco as well as the historic fresco pigments list". Fresco Pigments Base Set swatches painted on wet fresco tile - photographed fully dry. YELLOW OCHRE - (clay, ferric oxides) a hydrated iron oxide, also called Gold ochre. Ochres are among the earliest pigments used by people. The name Ochre is of Greek origin, ochres are made from naturally tinted clay containing mineral oxides. It is used as an overall yellow color in fresco painting. RAW SIENNA - (clay, ferric oxides) a chemical cousin of Ochre, it is of the earliest pigments used by mankind since cave paintings. Name comes from the notable Renaissance mining location near Siena, Italy. Sienna has a slightly darker, reacher reddish/brownish tone than ochre, but not as “red” as red ochre or red iron oxide and not as brown as raw umber. Transparently layered with yellow ochre produces interesting textural tones. BURNT SIENNA - (clay, ferric oxides) formed by burning raw sienna. A very versatile color, especially for the flesh tones and when a warm red undertone is needed. WHITE EARTH - (clay, ferric oxides) a delicate light color, used as additive to other colors to produce a softer, “pastel like” paint tones as well as in flesh tones as an alternative to or in combination with “Bianco di San Giovanni” (Lime White). On it’s own white earth is very good for rendering/toning trompe l’oeil plasterwork. VERDACCIO - (clay, ferric oxides) a dark green semi transparent earth color, a “composite pigment” - the mixture of yellow ochre and black iron oxide or mars black. 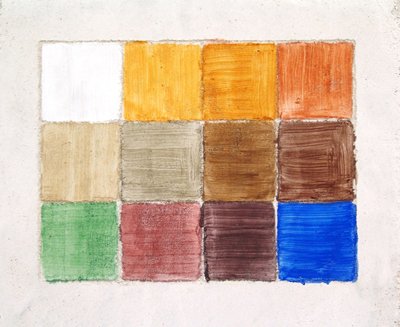 Verdaccio is a foundational color for the value range development (underpainting). It is neither warm or cold, color tones applied over absorb the value without changing corresponding properties. Often architectural details in frescoes are left in Verdaccio without any additional color layers. RAW UMBER - (clay, ferric oxides, manganese oxides) a brown color with a various degree of gray - greenish hue. Produces soft and “colder” shadows. In combination with Ultramarine and other Blues (layered and mixed-in) gives soft, grayish more transparent shades of black with lesser contrast then Burnt Umber - Blue combinations. BURNT UMBER - (clay, ferric oxides, manganese oxides) a dark warm brown color with a degree of “reddish” hue. Produces reach, contrast shadows. In combination with Ultramarine and other Blues (layered and mixed-in) gives deep rather opaque shades of black. Main color for contrast shadow accents, foreground shadow tones and hair. CHROMIUM OXIDE GREEN - (hydrated chromium oxide, eskolaite) a bright and more opaque green (compared to Terra Verde - Green Earth) of a clear green tone, more vibrant, blueish shade is known as “Viridian”. RED IRON OXIDE - (iron oxide, hematite) a manmade version of is known as Mars Red. An overall rusty red color as it is transparent washes give cold, purplish hue as opposed to warm reddish undertone of Burnt Sienna. It is used in preparation of flesh tones, mixed with white it gives a cooler pinkish undertone. Traditional Cinabrese (ital) is a “composite pigment”, a mixture of Lime White and Red Iron Oxide. For large frescoes Red Oxide and Red Ochre is also used to create “Sinopia” praparatory painting on the Arriccio (Float Coat) plaster coat. VIOLET IRON OXIDE - (iron oxide, hematite) a manmade version of Violet Iron Oxide is known as Mars Red (used for this tutorial). A rich dark brownish red with violet undertone, a deep opaque color used as it is as well as for the flesh tones - mixed with white produces violet pinkish tones. This is the base list of fresco pigments , you can have as many pigments of different shades as you want and need for different frescoes, just keep in mind that you always need to simplify your palette for efficiency.